Enable you to reverse, trim, and combine in a few clicks.. Playing a song or any other type of audio file backwards can be useful in a surprisingly diverse number of ways. Discovering subliminal messages in pop songs, creating unusual sound effects or learning to play a song in reverse are only a few reasons why you may want to reverse an audio. If you would like to find out more about the best audio reversers in 2018, you’ve come to the right place, because in this article we are going to take you through the some of the most attractive online options as well as PC, Mac and mobile solutions. To reverse and edit your video into a better level, we recommend you to try some professional editing software. Here, we recommend FilmoraPro professional video editor to reverse and edit audio. Reversing Audio in FilmoraPro is easy, just click the audio file in the timeline, and then go to the Effects tab. Click the Audio menu to choose from Audio Reverse option. The audio will be reversed automatically. If you want to change the reversed video speed, just right click the audio file in the timeline again to choose Speed/Duration to enter the Edit Speed/Duration window. Beside the audio speed changing, you can sync the audio automatically in FilmoraPro, and add audio transition effects, or reduce audio noise with ease. Check the FilmoraPro tutorial video below to find out some basic editing procedures about FilmoraPro. Click the Free Download button to download the free trial version today. Reversing a song and all other types of audio recordings is a straightforward process that doesn’t take a lot of effort or time. Let's have a look at some of the best online destinations you should visit if you’re looking to quickly reverse audio. This free platform lets you reverse audio files in a matter of minutes. You just have to click on the Choose File button and select the file you’d like to play backwards. The maximum size of the audio file you can upload to this online audio reverser in limited to 20 MB. As soon as the audio file uploads to the platform, it will be reversed, and you can just click on the Download button to save the newly created reversed audio file. The only downside is that you won’t be able to adjust the audio reverse settings because the process is fully automated. Short recordings of cymbals or any other type of frequently used effects can be quickly reversed with Online MP3 Reverser. The platform supports nearly all popular audio file formats, such as wav, ogg, m4a, aac and of course mp3, as suggested in the platform’s name. The maximum supported size of an audio file is 10MB. In order to reverse a song or an audio effect, you just have to click on the Choose File button to select the file and hit the Reverse It button to start reversing the audio file. Once the process is completed, you can save the file to a destination on your hard drive by clicking on the Download button. Even though the TwistedWave Online Audio Editor can be used free of charge, you must create an account in order to save the files you create. And the free plan has limited features in file length and audio editing features. The online audio editor enables you to record new audio files or to edit the existing ones. Audio clips can be imported from your computer, the Soundcloud platform or Google Drive. After you upload a file to the TwistedWave, the editor window will display the file on its timeline as a waveform. Clicking on the Effects menu and selecting the Reverse option will play the file you uploaded backwards. Selecting the Download option in the File menu will give you the access to the Audio Export window where you can adjust the file’s properties before saving it to your computer. At the moment there a lot of free audio editing software options available on the market which are powerful enough to enable you to reverse all sorts of audio files. 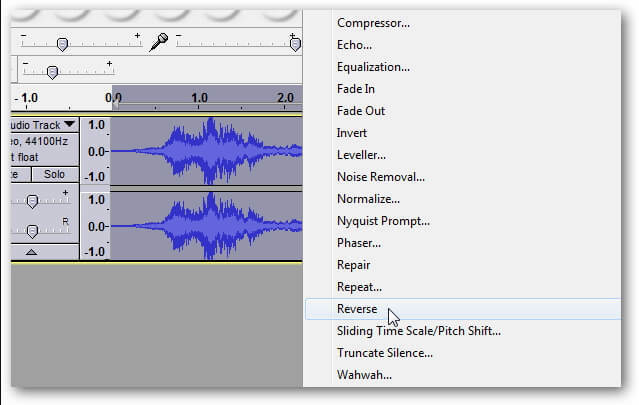 We recommend using the Audacity software to reverse your audio files. This free, open source and cross-platform software had 62.5 million downloads as of September 2018, which speaks volumes about its audio editing potential. The software is compatible with Mac, Linux, and Windows operating systems, and it offers a quick and easy way to reverse an audio file. After you’ve installed and launched the software, you just have to import the file, by selecting the Audio option, from the Import submenu that can be accessed from the software’s File menu. Alternatively, you can use the Ctrl+Shift+I keyboard shortcut to select the file you’d like to import into the software. The file will be displayed as a waveform and placed on the software’s timeline. You can then proceed to select the portion of the file you’d like to reverse by holding the left mouse button while dragging the mouse cursor between any two points within the file. Use the Ctrl+A shortcut to select the entire file or head over to the Edit menu, click on the Select option and choose All from the submenu. Once you’ve made sure that you properly selected the portion of the file you’d like to reverse, you should go to the Effects menu and click on the Reverse feature. The software will reverse the highlighted portion of the file and you can listen to the results by clicking on the Play button. The Export Audio option that is available in the File menu lets you save the reversed audio to a chosen destination on your hard drive. Listening to reversed versions of your favorite songs on your Smartphone can be a lot of fun, so if you would like to explore the possibilities of reversing audio directly from an iPhone or Android device you should check out these apps. The Reverse Music Player is an Android-based app that lets you reverse sounds or music with ease. What’s more, you can make a song’s tempo up to 4 times faster or slower or adjust its Pitch. The app supports wav, mp3, ogg and flac audio file formats, but if you are using a large audio file reversing a song may take some time. A three-minute song can temporarily take up to 20MB of storage space on your phone’s memory card, while longer songs may take even more, so it is important to make sure that you have enough free space on your phone before you start using this app. 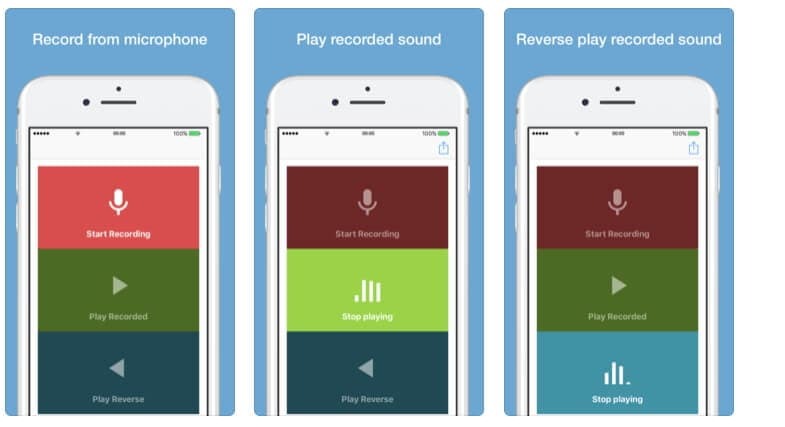 iPhone users can reverse audio files they record with this app in just a few simple steps. The app lets you record an audio file and then it automatically plays the recording backwards. While you’re playing the audio, you can alter the Playback Rate or the Pitch. The Reverse Audio app also enables you to import audio files from other apps via the Share option, but audio files cannot be directly imported into the app. The limited amount of audio editing options makes this iOS-based app a moderately reliable choice for reversing audio files. Playing songs or audio effects backwards can have unexpected results, which makes the process of reversing audio incredibly entertaining. 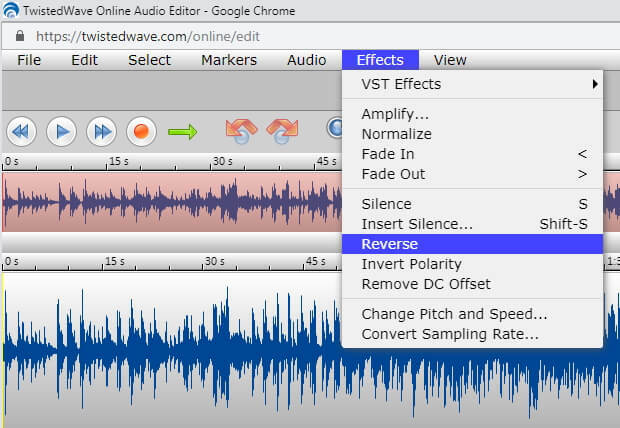 These free and easy to use audio reversers can help you create high-quality sound effects that might make the videos you used them for, go viral. What is your favorite method of reversing audio files? Leave a comment below and let us know.